The economic, cultural and social relationship between both the Saudi Arabian and the Bahraini kingdoms are decades old. This can be attributed to the fact that Saudi Arabia is the closest neighboring nation to Bahrain’s main island; in fact, the two kingdoms are connected via the 25-km King Fahd Causeway which arcs over the gulf. Such a relationship has been notably reflected in the joint projects between the two nations, the latest of which was King Abdullah Medical City in Bahrain. The project is funded by a SAR1bn ($265m) grant provided by the late king of Saudi Arabia Abdullah bin Abdulaziz Al Saud, after whom the medical city was named. 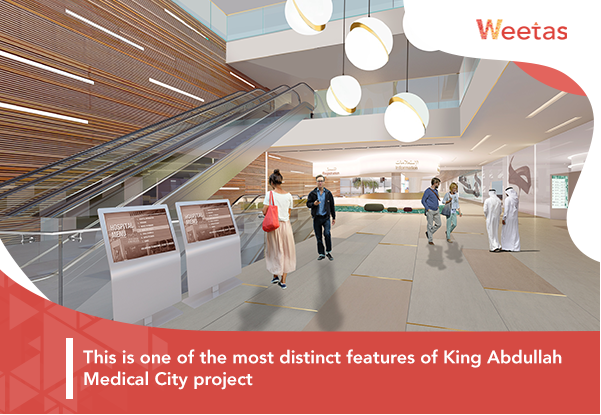 King Abdullah Medical City is situated in Durrat Al Bahrain man-made islands off the southeastern coast of Bahrain; it spans around 1,000,000,000 square meters of land donated for the project by King Hamad of Bahrain. The city aims to mainly serve the citizens and visitors of the Southern governorate of the Bahraini kingdom. 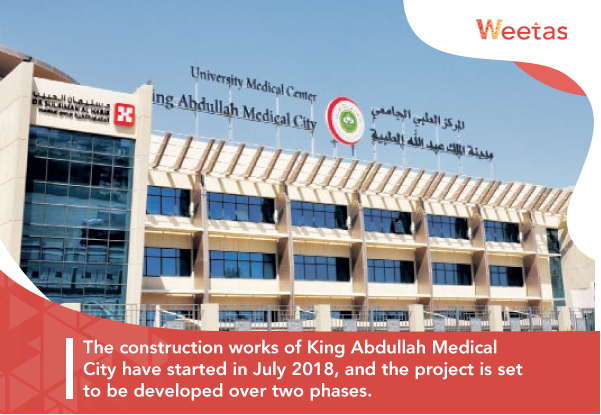 The construction works of King Abdullah Medical City have started in July 2018, and the project is set to be developed over two phases. Upon its completion, the first phase of King Abdullah medical City will include three buildings: an 8-storey educational hospital with the capacity of 288 beds; a three-storey outpatient clinic; and a building that will provide clinical services that include operating theatres, a morgue, and restaurants. The educational hospital will feature sections for surgery, paediatrics, and obstetrics and gynecology. The hospital’s beds include 144 assigned for medical surgery, 36 for obstetrics and gynecology, 24 for neonatal intensive care unit, 36 for medical and surgical Intensive Care Unit,12 for labor and delivery rooms, 12 for pediatric day cases and 24 for pediatrics. In addition to that, phase 1 comprises many other facilities including an academic medical center, accomodation for the staff, parking spaces, and a retail store. 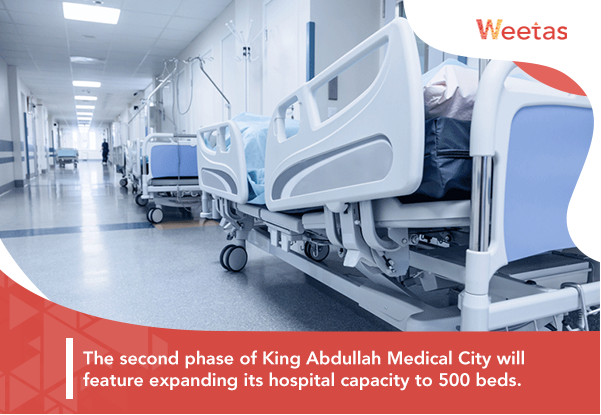 The second phase of King Abdullah Medical City will feature expanding its hospital capacity to 500 beds. In addition to that, the phase will comprise building additional healthcare facilities including a clinical research center equipped with the most advanced medical and research equipment and tools that will be dedicated to develop solutions for the most recurring diseases in the GCC region including obesity, cancer, and others. The second phase will also house conference centers, a rehabilitation center, a 100-key medical hotel as well as non-healthcare supporting facilities like a retail center, a mosque and a nursery. 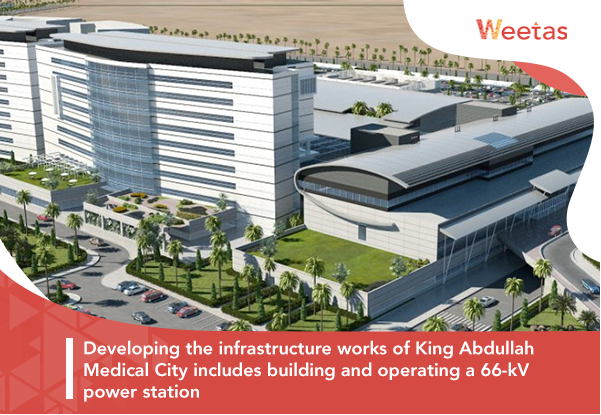 Developing the infrastructure works of King Abdullah Medical City includes building and operating a 66-kV power station, sewage and storm water drainage networks, sewage treatment plant with the capacity of 500 cubic meters per day, water collection tanks, internal and external networks and more facilities that would help make the medical city more sustainable. This is one of the most distinct features of King Abdullah Medical City project. 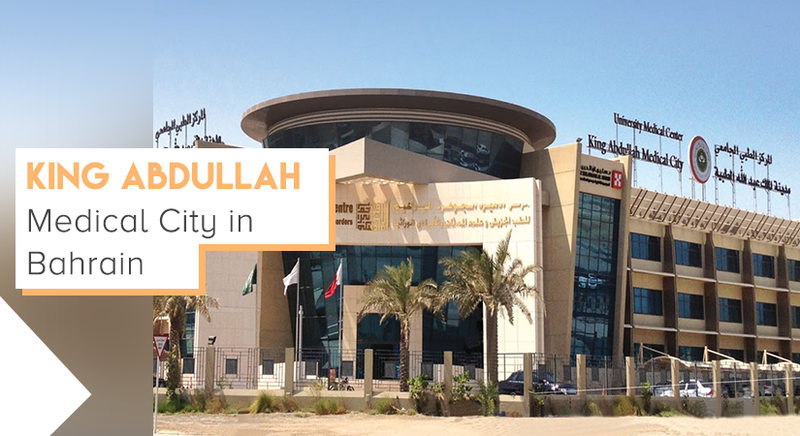 Arabian Gulf University, the accredited educational entity governed by GCC countries, is situated in Salmaniya, Manama. 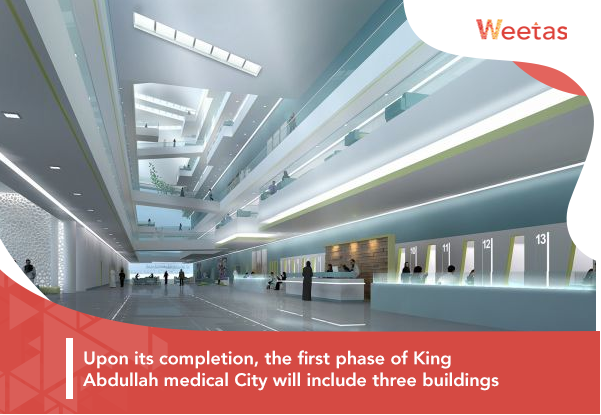 However, it has been announced that the university’s faculty of medicine is to be moved to King Abdullah Medical City. It is worth mentioning that the aforementioned faculty of medicine has more than 400 students currently. 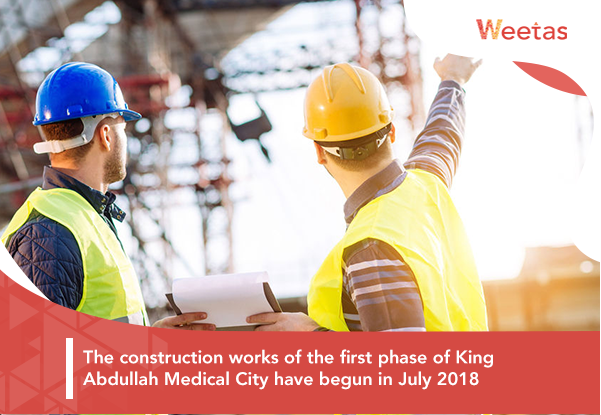 The construction works of the first phase of King Abdullah Medical City have begun in July 2018; the pre-construction preparation works of the city are now complete. According to Khalid Al Ohali, the President of the Arabian Gulf University, the construction tenders are planned to be issued in early 2019. Al Ohali also stated that the work on the project will be completed within the year 2020. With all the mentioned features compiled in one site, the city is expected to boost the Kingdom of Bahrain’s reputation as one of the top global attractions for wellness tourism. This is further supported by the launch of similar mega projects like Dilmunia Health District in Dilmunia Island and others. Thus, it is safe to say that a lot of investors will set their eyes on the Saudi-Bahraini joint project; we will keep an eye on the project’s progress and keep this article updated with it. The project is expected to boost the local property market in the area as demand is awaited to rise on displayed apartments for rent in Adliya, Salmaniya, and other residential districts of downtown Manama.